Ruth Richards is Professor of Psychology at Saybrook University, in the College of Social Sciences, and works in areas of Consciousness, Spirituality, Integrative Health, and in Creativity Studies. She does qualitative research, and also works with www.ahimsaberkeley.org, an interfaith and social action organization. She is currently in Brooklyn, NY, participating with www.bwac.org, the largest non-profit, volunteer artists' organization in Brooklyn, with major gallery and performance space, furthering the voice of New York and the local community. 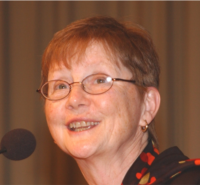 Dr. Richards' numerous publications include the edited Everyday Creativity and New Views of Human Nature, and she is winner of the Armheim Award from Div.10 of the American Psychological Association for outstanding lifetime achievement in psychology and the arts. Her many interests include healthy benefits of creative process for individuals and cultures, for personal, ethical, and spiritual development, issues of empathy and relational creativity in a troubled world, questions of beauty and awareness, and applications of Chaos Theory to an emerging worldview and view-of-self in the 21st century. We help students pursue their goals and passions within a context that provides rigor, excellence, and creativity, in how one defines, develops, and researches an area. The breadth and creative possibilities of this area, the chance to explore human potential, spiritual possibility, and to play some role in redefining both worldview and view of self-in-world, during these troubled times. This is a great place that will honor you, challenge you, and for many of our students, can produce some amazing and transformative changes. One never knows! Let us all move forward together. Runco, M., & Richards, R (Eds) (1998). Eminent Creativity, Everyday Creativity, and Health. Greenwich, CT: Ablex/Greenwood Publ. Co..
Richards, R. (Ed.) (2007). Everyday Creativity and New Views of Human Nature. Washington, D.C.: American Psychological Association.